Dr. Roger Greenaway's guide to active reviewing (debriefing) will help you engage people more deeply in learning from experience. Whether you are a Teacher, Trainer, Coach, Consultant, Facilitator, Groupworker or Manager, these interactive methods will help you achieve more focus, impact and change. Find smarter ways of helping people learn from experience. Discover how to make debriefing more dynamic and productive. Develop your toolkit for engaging people in meaningful reflection and review. Make reviewing itself a valued and memorable experience. Re-charge your facilitation skills with practical tips and tools for active and effective debriefing. Find CPD events in this UK Calendar for experiential trainers and outdoor educators. Index Pages Archives Articles Books & Reviews Calendar of Events Client List FAQ Links Outdoor Pages Research Tools for Change Training Workshops What's New? What else do clients say? 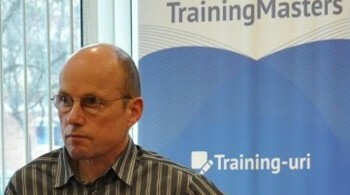 ONLINE COURSE Active Reviewing: A Practical Guide for Trainers and Facilitators with Bogdan Vaida. See Thiagi's review. 5+ VIDEOS On YouTube: Active Learning | Action Replay | Moving Stones. Previews: Storyline | Missing Person. UK CPD LISTING UK CPD Calendar and monthly listing for experiential trainers and outdoor educators. "Your training has had a huge impact. At a guess the training of 8-10 people that day has lead to the use of your tools to at least 500 people plus! Your training workshop 'moving bodies moving minds' has certainly done that. It opens minds, ensures everyone contributes, helps people think differently, shares different views and develops ideas." "Whenever I point one of my Agile coach friends to your material they are wowed - big time! And these are people who live and breathe 'facilitation'." 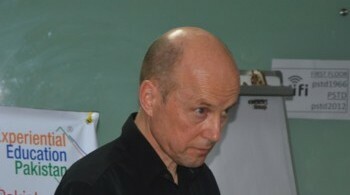 "Roger is highly professional and highly respected in the field of Experiential Learning and Management Development. He has successfully worked with senior faculty at Ashridge Business School on two occasions and his techniques are widely used in the organisation." “We’re still talking about your workshop and, more importantly, putting lots of the techniques that you taught us into play in our on-going programs. This is quite something since our faculty have been around the block, have decades of facilitation experience between them and are not easy to impress! So, a huge thank you for all that you brought us!”. Partner, THNK School of Creative Leadership. "Roger's active and creative reviewing skills are the absolute cornerstone of our work in facilitating team and leadership development at Azesta ... our clients are continually praising the interesting, creative and active reviewing techniques that we use." "I recommend Roger and his work with reviewing. He is one of the finest facilitators I know. His reviewing method has revolutionised my own work, and it keeps on being an inspiration." "We have used many of your reviewing tools and transfer strategies in our programs already, very effective and innovative! Our clients like it, we like it… my favorite is Metaphor Map, which I used a lot as last summarize activity in my program with fantastic effects!" "Roger showed the capacity to adapt quite easily to our Chilean culture. As a result we had an excellent and memorable training. 100% of the Roger´s work was applicable and practical and very clever and based in deep knowledge and experience." "Roger knows more about how to turn experience into learning than anyone I know, or know of. His particular brand of creativity--always seeing multiple ways to look at things, plus deep experience and thoughtful, research-based approach make him second to none in his field." "We looked long and hard for a facilitator to work with our team... All approaches to Roger came back with a thoughtful and insightful response. We felt certain we could work with Roger ... and we would not hesitate to work with Roger again." "Roger is a world class master at evoking wise action from groups. If you wish your groups and teams to take even wiser and even more effective action, I strongly recommend getting to know Roger personally." "I have seen Roger work across cultures with a natural ease that is inspiring. It is hard to find an equal combination of modesty and excellence in experiential education or training." "Roger is the world leader in reviewing and experiential learning... He changed the way people in South Africa think about outdoor and indoor activities and taught us how to add value to any activity." "This course is hands-on and ready-to-use, with depth. It removes the barrier between the playful and the useful. My advise: Take the first tiny bit you find inspiring, and just do it! Make an experience of it, and return for further inspiration." "Anyone who facilitates debriefs or retrospectives, or even convenes meetings MUST take the time to learn from Roger Greenaway and company. The interactive techniques of this group are a potent learning accelerant that not makes teams more productive, more creative and more happily engaged." I've been a trainer for years, I always keep me up-dated with new techniques and from this course I went away with practical and inspiring techniques to implement in my own practice. I also liked the quality of the materials. It was definitely worth time and money invested. "reviewing.co.uk helped me tremendously in my facilitator career. Before reading Roger's materials I was doing a maximum of one review per training session with moderate success. After reading the materials I have implemented active reviewing throughout my trainings and the changes have been instantaneous." "One of the best training sites I've ever seen." "It is an amazing site ... there are so many practical suggestions and tips provided here." "A refresher. Creative ideas. Practical for those with a 'yearning for learning'." "The content has really lured me into becoming a daily visitor to your site. Thanks." "Your work has a sense of inclusivity and completeness not found in many other writers." "Lots of great ideas for anyone interested in experiential education." "I liked all the possibilities presented here ... This was just what I was looking for!" "Your site is awesome. It has been extremely helpful with our "Train the Trainer" program." "It is fabulous. What you say really hits home"
My freee monthly newsletter "Active Reviewing Tips" will keep you up to date with the latest articles, tips and workshops. Check the archives to see what you have been missing. Or view the sign up page to see what you will be receiving if you choose to join in and subscribe now.